A neuroma is the swelling of the nerve that is a result of a compression or trauma. They are often described as nerve tumours. However, they are not in the purest sense a tumour. A Neuroma is a swelling within the nerve that may result in permanent nerve damage. The most common site for a neuroma is on the ball of the foot. The most common cause of neuroma in the ball of the foot is the abnormal movement of the long bones behind the toes, called metatarsal bones. A small nerve passes between the spaces of the metatarsals. At the base of the toes, the nerves split forming a “Y” and enter through the toes. It is in this area, the nerve gets pinched and swells, forming the neuroma. Burning pain, tingling, and numbness in one or two of the toes is a common symptom. Sometimes this pain can become so severe, it can bring tears to a patient’s eyes. Removing the shoe and rubbing the ball of the foot helps to ease the pain. As the nerve swells, it can be felt as a popping sensation when walking. Pain is intermittent and is aggravated by anything that results in further pinching of the nerve. When the neuroma is present in the space between the third and fourth toes, it is called a Morton’s Neuroma. This is the most common area for a neuroma to form. Another common area is between the second and third toes. Neuromas can occur in one or both of these areas and in one or both feet at the same time. 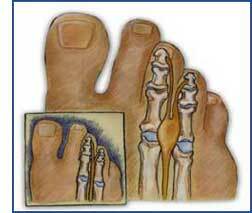 Neuromas are very rare in the spaces between the big toe and second toe, and between the fourth and fifth toes. Neuromas have been identified in the heel area, resulting in heel pain. The diagnosis of Neuromas is made by a physical exam and a thorough history of the patient’s complaint. Conditions that mimic the pain associated with Neuromas are stress fractures of the metatarsals, inflammation of the tendons in the bottom of the toes, arthritis of the joint between the metatarsal bone and the toe, or nerve compression or nerve damage further up on the foot, ankle, knee, hip, or back. X-rays are sometimes taken to rule out a possible stress fracture or arthritis. Because nerve tissue is not visible on an X-ray, this will not identify the neuroma. A skilled foot specialist will be able to feel the neuroma during his exam of the foot. Special studies such as MRI, CT Scan, and nerve conduction studies have little value in the diagnosis of a neuroma. Additionally, these studies can be very expensive and generally the results do not alter the specialist's treatment plan. If the foot specialist cannot feel the neuroma during the exam, and if the patient’s symptoms are not what is commonly seen, then nerve compression at another level should be suspected. In this instance, one area to be examined is the ankle. Just below the anklebone on the inside of the ankle, a large nerve passes into the foot. At this level, the nerve can become inflamed. This condition is called Tarsal Tunnel Syndrome. Generally, there is no pain at this site of the inflamed nerve at the inside of the ankle. Pain may instead be experienced in the bottom of the foot or in the toes. This can be a difficult diagnosis to make in certain circumstances. Neuromas, however, occur more commonly than Tarsal Tunnel Syndrome. Treatment for the neuroma consists of orthotics, ultra-sound, combination therapies chemical destruction of the nerve, or surgery. Cortisone injections are sometimes used depending on the practitioner. To address the abnormal movement of the metatarsal bones, a functional foot orthotic can be used. These devices are custom-made inserts for the shoes that correct abnormal function of the foot. The combination treatment of therapies and orthotics can be a very successful form of treatment. If, however, there is significant damage to the nerve, then failure to this treatment can occur. When there is permanent nerve damage, the patient is left with three choices: live with the pain, chemical destruction of the nerve, or surgical removal of the nerve.